CrazyKinux's Musing: 10 days left for the EON half-price offer! EON magazine, the best pulp gaming magazine period, is celebrating it's 5th year! Yeah, that's 16 issues published so far and I still have to say, the magazine's gone from great to even better, and now should be a necessity for every capsuleer worthy of flying a ship from the confines of a pod! If you're not sure that there's something of value in this beauty of a magazine for you, simply check-out the Table of Content I've put together for each of the issues published so far. I rest my case! To celebrate EVE's official magazine as it enters a fifth year, MMM Publishing is putting all back issues on sale. For a limited time only you can get all 15 of the first issues of E-ON for just $7 each – that’s less than half the regular cover price and cheaper than any games magazine on the planet! Not only that, but all subscriber freebies will be included, but only for as long as they remain in stock! The offer ends on 13th September, so get your order in early! 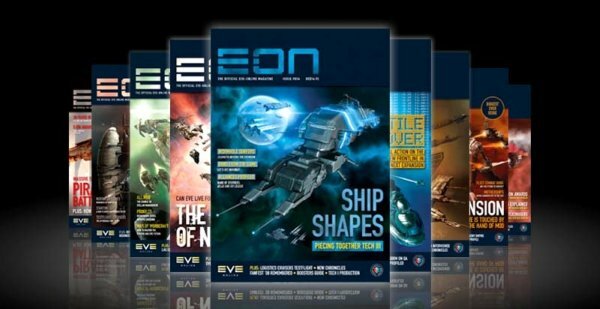 All Back issues are still available – you’ll find them in the EVE Store. Quote the code EONM50 when you check out your order to get the discount. Now get yourself over to the EVE Online Store and get those orders in, lest you miss out on all the extra goodies that'll be included with those back issues! Nuff said!